I’m the guest designer at the Anything But a Card challenge blog today. The theme for the August Challenge is “REPEATING Motifs” a.k.a. PATTERNS. This can be any craft or work of art that uses a repeat design. 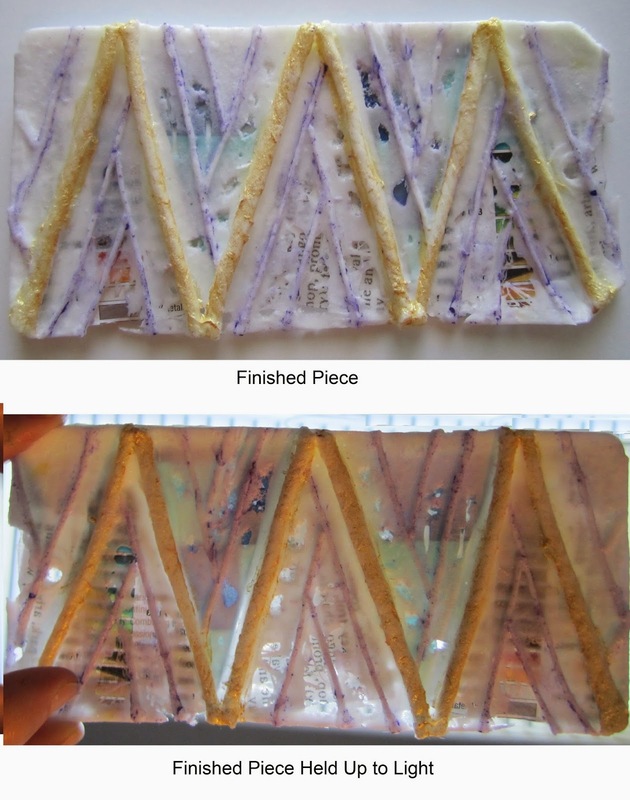 Anything from a Zentangle® tile to a patterned clay tile, a journal page with repeated designs to a piece of cast resin. Anything with patterns—as long as it isn’t a card. 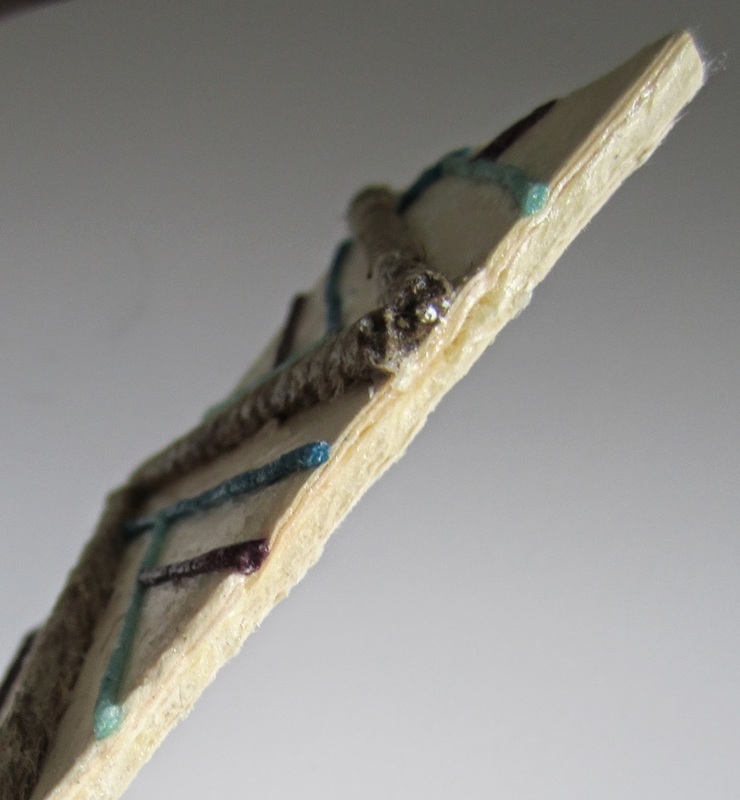 For my challenge piece, I glued string to a manila tag, using the Zentangle® pattern Hibred. Of course, this is also a pattern of great antiquity that you may have seen decorating walls or used in quilting or gourd painting. But the Zentangle pattern breaks it down into nice, easy steps so anyone can draw it. The steps worked well for my tag. Instead of drawing a line, I just glued down a piece of string. To prepare, I marked three even spaces on each side of my manila tag, and used them to draw the initial triangles for my Hibred pattern. 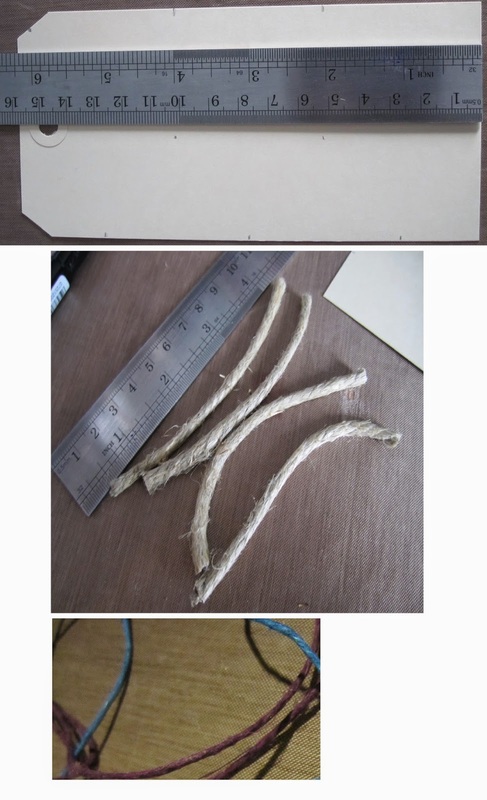 I measured the length of each triangle side and then cut six pieces of twine to a bit more than that length. I gathered up string, but didn’t cut it at this time. I glued the twine down on the drawn lines. The reason I left each piece long was because twine often unravels when it is cut. I drenched the edges in glue and once it dried, I trimmed them to the edges of the card. 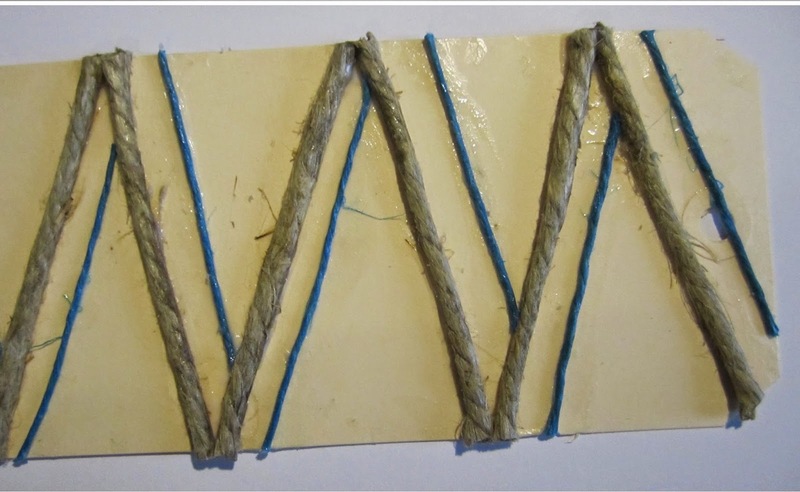 The glue kept the twine from unraveling. This would correspond to the second step of the Hibred pattern. I more or less skipped step one because the edges of the manila tag create the border lines. 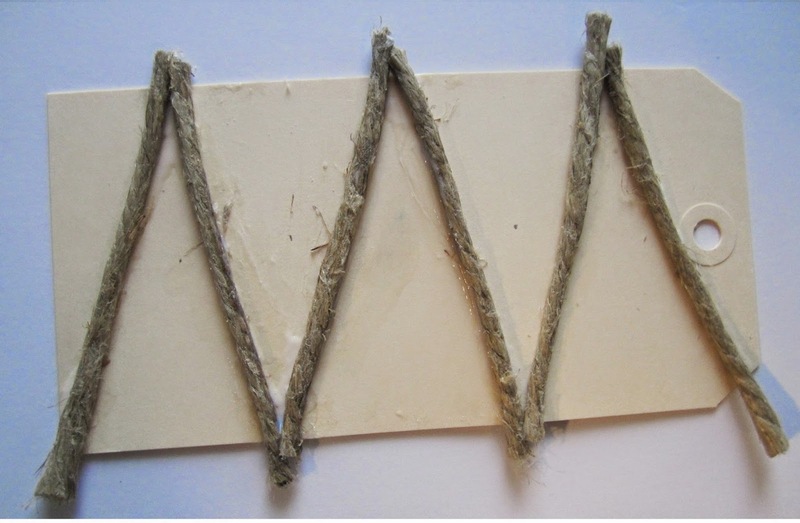 I measured a length of string from the card edge to place where I wanted it to meet the twine for the third step, cut six more pieces that length, and glued them down. I repeated this step, measuring from the edge of the tag to where I want the second row of string (vs the twine) to meet the first row. 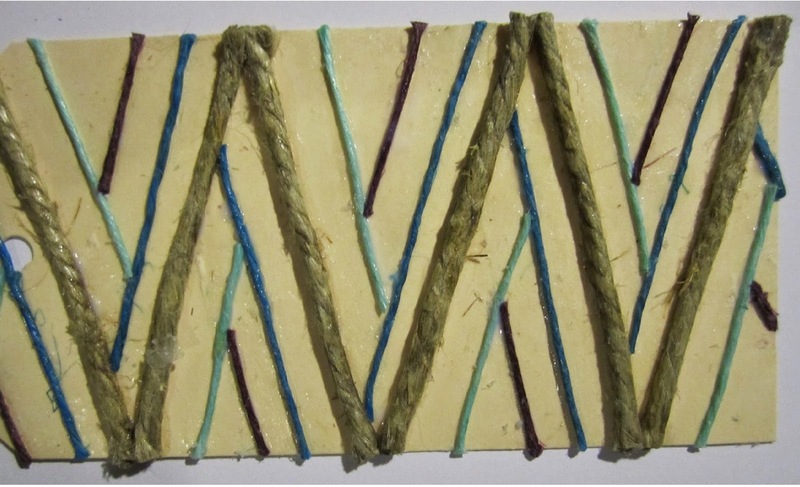 I then repeated one more time so that I had three lengths of string within each triangle of twine. I could have stopped at this point or gone a different way and painted or tangled another pattern between the strings. I had something I wanted to try though, so I pulled out my Amazing Mold Putty and Amazing Casting Resin. Just the manila tag alone would have created a very shallow mold, so before going further, I cut a piece of foam core to the size of the manila tag, and glued it to the back. I also put a dot of glue over the tag’s hole. Easy enough to carve it back out once cast, and this gives me the option not to have the hole. 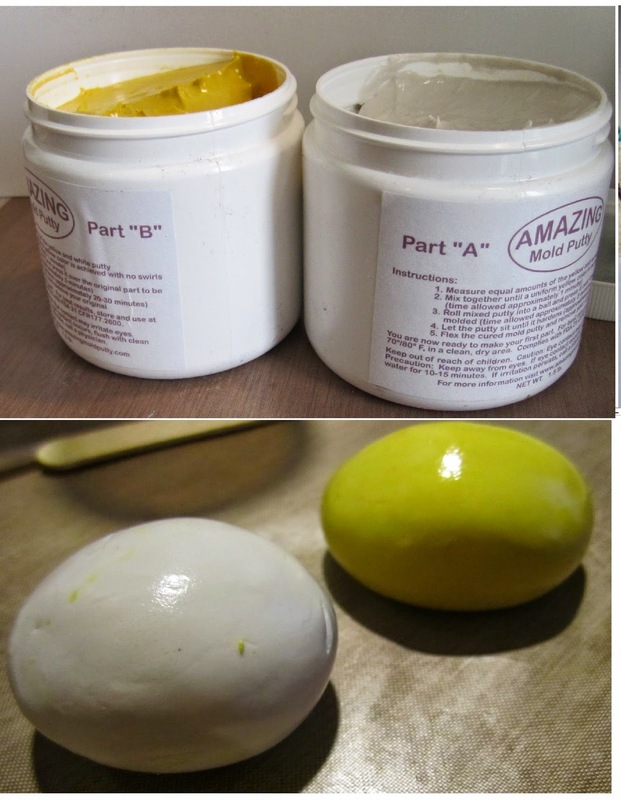 To make sure that nothing would stick to the mold putty, I coated the tag and strings lightly with vegetable oil. I pulled out enough of Part A and stretched it to see if it would cover about half of the tag. I added more until I was satisfied it would, and then pulled out an equal amount of Part B. 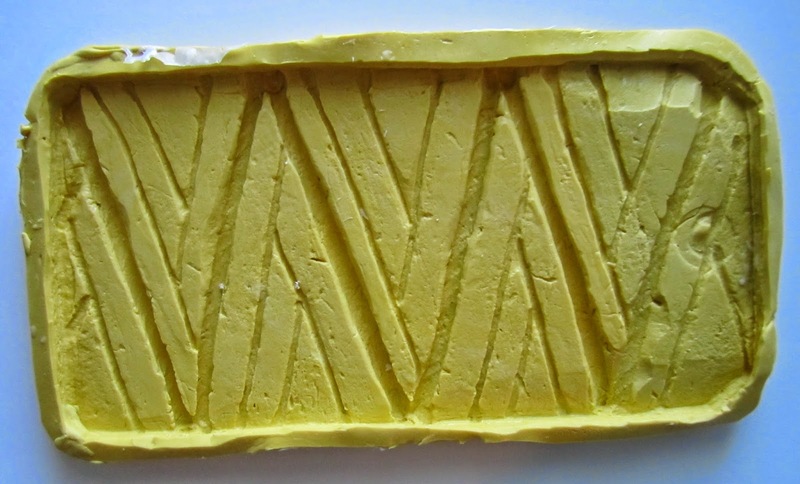 After rolling them, to get the putty even, I mixed the two putties together until both were a solid yellow. Moving quickly at this point, so quickly that I forgot to take a photo, I stretched the putty around the tag, working it over the sides. Then I flipped it over, and pressed it gently down so the bottom would be flat. Amazing Mold Putty sets in about 3-5 minutes, depending on temperature and humidity, so I only had to wait a few moments and I popped the tag out. Now I can create patterned tags whenever I want! I was totally experimenting at this point. I wanted a collage look, with paper scraps–text, photos, etc.–filling in the areas between the twine, but bisected by the strings. 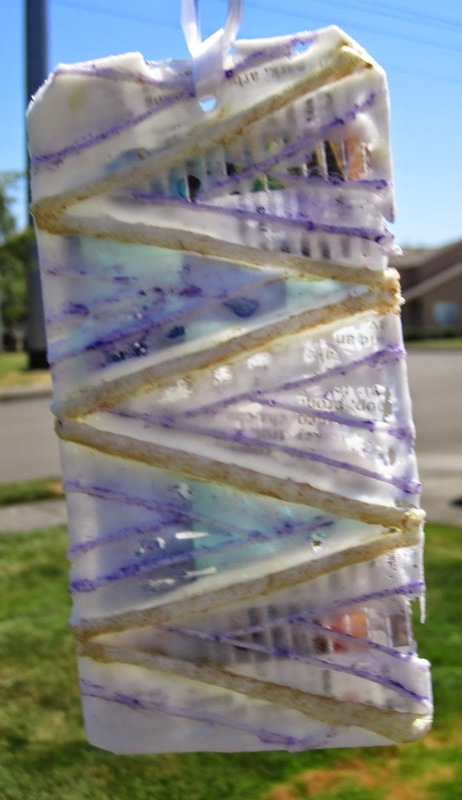 I had originally thought about using Amazing Clear Cast Resin, but I didn’t have any on hand, but I began to wonder what would happen if I embedded the paper scraps in the Casting Resin, which cures white. 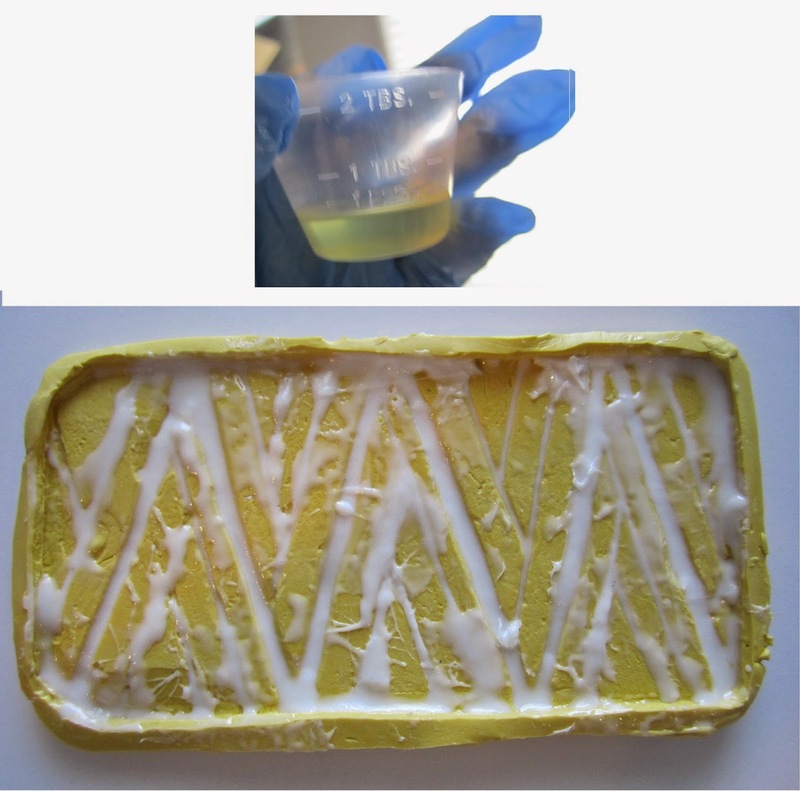 I poured a small amount of Parts A and B, using the TSP measurement of the cups that come with the Casting Resin, and then mixed them together, thoroughly until the mix was clear. Pouring carefully, I filled the deeper parts of the mold. I used a toothpick to help guide the resin. I thought about wiping away the resin that spilled over, but this was an experiment, so I decided to just let things happen as they would. 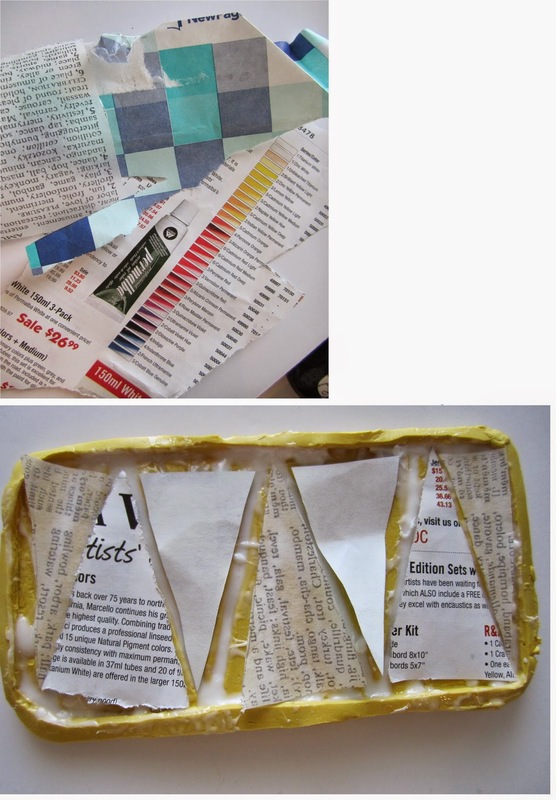 I took some paper scraps–pieces torn from an art supply catalog, the wrapping around a ream of printer paper, and from printed art tissue–and cut them into triangles that would fit between the large triangles of the pattern. I cut two triangles from each kind of paper and lay them, picture side down onto the mold. I lay them out so that each kind was equidistant from itself, which means they created a repeating design, aka a pattern. Then I mixed up another, larger batch of resin, about 2 tsps of each part, and poured it over the scraps. With the popsicle stick that I had used for stirring, I kept pushing the paper scraps down, trying to keep them as flat as possible. The idea was to let the resin coat them, but not completely cover the front of them. I did this until the resin started lumping, and a little beyond that point. Amazing Casting Resin sets in about 5 minutes. I pulled it as soon as I could. 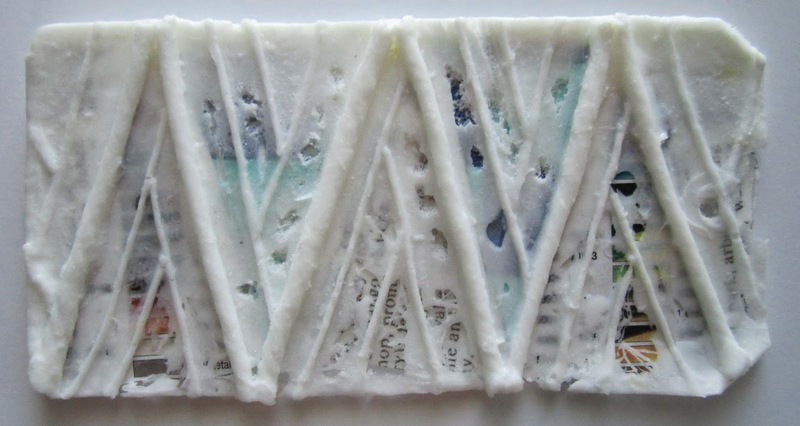 The resin was very lacy in some areas, translucent in others, and totally covered the scraps in some areas. I used an exacto knife, while the resin was still soft, and cut away holes in some of the thicker areas just to add more ‘lace’. I also cut out the ‘tag’ hole. At this point, the tag made me think of Christmas Trees, I thought of painting it that way, but the theme for this challenge is Repeating Motifs and I wanted to bring the pattern out a little more. 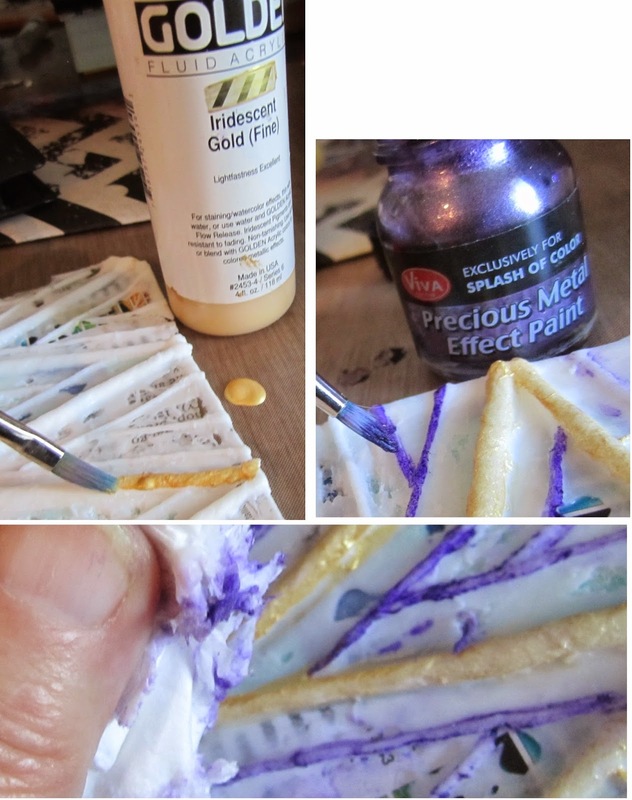 I painted the lines of the Hibred pattern with Iridescent Gold and Metallic Purple. That brought out the pattern nicely, but took away from the frost-and-lace look, so I wiped off most of it with a paper towel, just leaving a tint. I can think of several things to do with this, but I think it’s going to be a suncatcher. Next time, I’ll do things a little differently. I kept flattening the paper too long, and the back of the tag is lumpier than I like. I’ll try paper with brighter colors that are a little heavier. The fun part is that I don’t know if that will make things better or worse. I love surprises! I hope you enjoyed my how-to and that I’ve inspired you to head over to the Anything But a Card challenge blog to enter a piece of your own. Remember, it doesn’t have to be as complicated as mine was. It just needs to use a repeated design and NOT be a card!